Both performance offer an opportunity for everyone to join in dance with one of the works performed by Quartango. Comprising four highly accomplished musicians, bound by their shared passion for the tango and driven by an unceasing desire to make a close connection with their audience, Quartango offers a performance filled with subtle nuances and a blend of colours that reflects both the classics and modernity and the effervescence of the milonga. 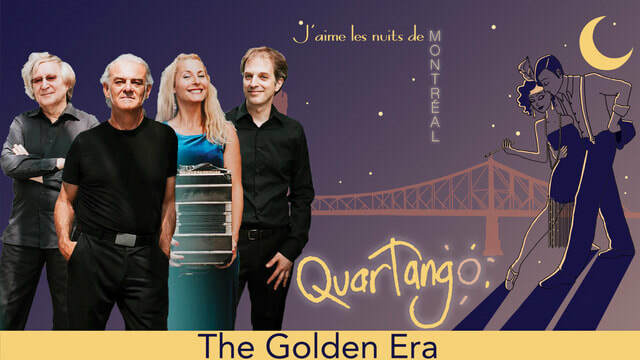 Quartango’s awards include three Opus Awards from the Conseil québécois de la musique, notably 2007/2008 Artist of the Year, a Félix Award and a Juno nomination. The ensemble also continues to delight critics and audiences alike: “The Montréal group heated things up with a concert that was nothing short of brilliant. It was dramatic. It was elegant. It was everything tango music should be,” wrote Kelly-Anne Reiss for the Regina Leader-Post following a concert. Quartango has performed all over Canada as well as on the international stage, from Ankara and Tokyo to Taipei, Paris and New York, where they shared the stage at Carnegie Hall with the New York Pops. More recently, they performed in Guatemala and with the Buffalo Philharmonic Orchestra under the direction of Maestro JoAnn Faletta. “With elegantly flawless arrangements full of sensuality and wry humour, this group of classically trained musicians infuses the tango with a fascinating mixture of pathos and heat … The story these four musicians tell on Astor Piazzolla’s Adios Nonino is breathtaking. The violin and bandoneon are like plaintive lovers, with the piano narrating the scene as the double bass wickedly plays the devil’s advocate. I swear it’s palpable,” said Harold McNeil, news staff reviewer for The Buffalo News. Radio-Canada and the CBC have broadcast many Quartango concerts and the group also appeared on the CBC Television program Opening Night. As well, Quartango appeared in and provided original music for the soundtrack of the film Macadam Tango, which aired on Radio-Canada television and TV5. Quartango has recorded seven CD, several of which have been honored with awards. Their latest recording, Encuentro, was released in the fall 2013. Encuentro has been nominated at the ADISQ gala on fall 2014, won an OPUS at Quebec Music Council as well as a JUNO award in 2015 for the instrumental album of the year! Quartango sheds new light on the music of the tango, elevating it to an international level.